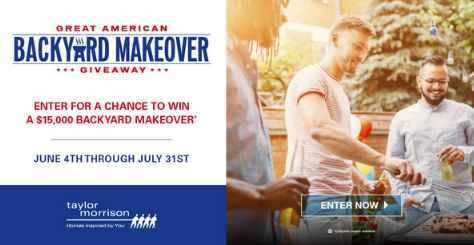 Taylor Morrison brings you the Great American Backyard Giveaway where they will be giving away $15,000 to one lucky winner to create the ultimate backyard escape. Visit this link:Taylormorrison.com/backyard-giveaway to go to the giveaway page. Once you have filled out the entry form now Click on the “Submit Entry” button in order to enter this giveaway. Prizes You Could Win: One (1) lucky prize winner will be randomly selected from all eligible participants to receive the Grand Prize which consists of one (1) single-family residence backyard makeover(“Grand Prize- Great American Backyard Makeover”) for Grand Prize Winner’s primary residence located in any eligible state. The total Approximate Retail Value (“ARV”) of the Grand Prize is $15,000. Who Can Enter: This sweepstakes is open only to legal residents of the fifty (50) United States District of Columbia excluding residents of New York, Alaska, Hawaii, Rhode Island, Puerto Rico and the U.S.Virgin Islands where the Promotion is void and who are twenty one (21) years of age or older at the time they enter the sweepstakes.